Every now and then I hit one out of the park. Scanning the fridge yesterday, I found ingredients that came together for a dinner winner. 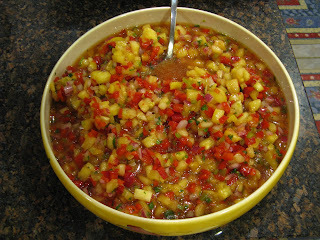 Of course, you can't go too far wrong with excellent frozen Yellowfin Tuna, but on a whim, I created some pineapple salsa with remnants of fresh ingredients from earlier in the week. Although I've never made it before, pineapple just seemed to be perfect for the first tuna of the grilling season. Our generous nextdoor neighbors supplied fresh asparagus from their garden and I roasted little red potatoes, prepared from a recipe (coming soon!) I had worked on recently for an article on honey . . . and voila! Dinner looked so beautiful on the plate that I couldn't help myself. Like a good blogger, I grabbed my new camera to snap a few pics before digging in. Always the gentleman, MFH tried to wait, and I tried to hurry the photo shoot, but he was sending compliments my way before I could master the settings to accommodate the low light in the kitchen. Just think of it as dinner by the warm, soft glow of candlelight and forget that we were sitting at the counter in the kitchen, watching the dvr'd episode of In Plain Sight. And yes, Photoshop is on my list to learn, along with the new camera! Maybe it was the long day of gardening in unseasonal and extremely windy 85-degree weather, the skipped lunch, and the martini enjoyed with neighbors at the end of a beautiful dry, mosquito-less day, but we absolutely enjoyed dinner. And the last thing MFH said, as he drifted off to sleep last night, was "great dinner" . . . Blend all ingredients in a bowl and allow to sit at room temperature for at least 30 minutes before serving with fish, chicken or pork. I used Anaheim pepper in place of the jalapeno, since that’s what I had on hand. I like a little more cumin and a nice amount of Cholula too. Also added some of the pineapple juice. Delicious! Mix olive oil, soy sauce and a little brown sugar in a ziploc bag or dish large enough for tuna pieces to sit in marinade. Refrigerate for about 30 minutes. Heat grill and cook tuna to your liking. A couple of minutes per side will leave it very rare in the center, longer if you like it less rare. We cooked ours about 4 minutes per side, because they were at least 1-inch thick. Isn't it great when you hit on something that becomes an instant favorite? You're smart to write down what you did, while you still remember. I always keep paper and pen in the kitchen so I can scribble notes when I'm improvising. Oh yes, Lydia, I learned the hard way about not writing ingredients, methods and times down before they vanish completely from my memory. My computer sits in the kitchen with me now when I cook! What a wonderful spring meal!